Last spring, I was totally absorbed in trying to write something worth reading–and in fact, today The Illuminator Rising is on an Amazon Top 100 list! Woohoo! This summer, I’ve been busy trying to catch up on the other half. So for the next few weeks, I’m going to be sharing posts about some of the events that have brought color and life into this summer. Some of them may or may not wind up as ingredients in the creative soup for The Voyages of the Legend, Book 4! 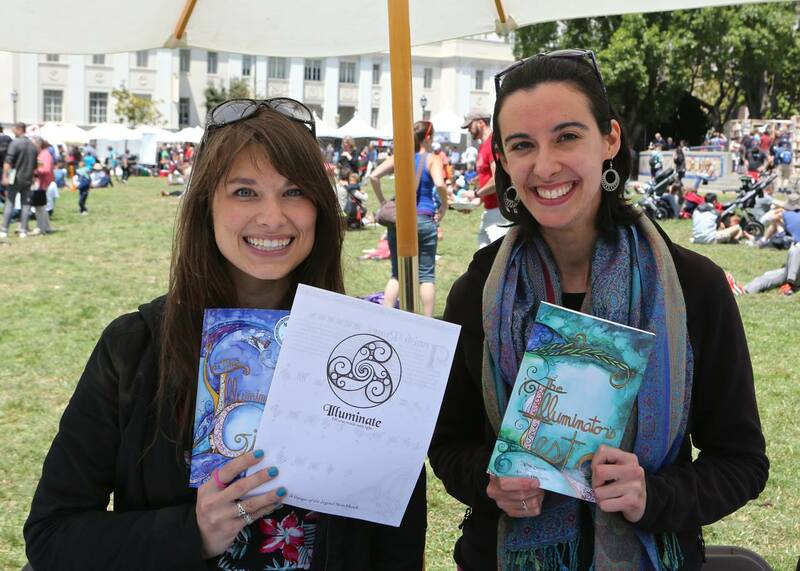 Today takes us back to the Bay Area Book Festival (June 4-5) in Berkeley, CA! It is a special, special thing to have an entire city rope off its downtown for a 2-day extravaganza just for bookworms. While I was 500% exhausted afterwards, it’s so fun to just be able to strike up a conversation with anyone in a crowd, knowing that you have a love of books in common. My wonderful mom was my table buddy and partner in crime for the weekend. She used her whiz artistic skills to paint Voyages of the Legend designs on the hands of visiting readers! I got to network with some literary colleagues of all stripes: librarians, teachers, and fellow authors, to name a few. One of the coolest booths I saw was an artisan who makes shelves, etc. 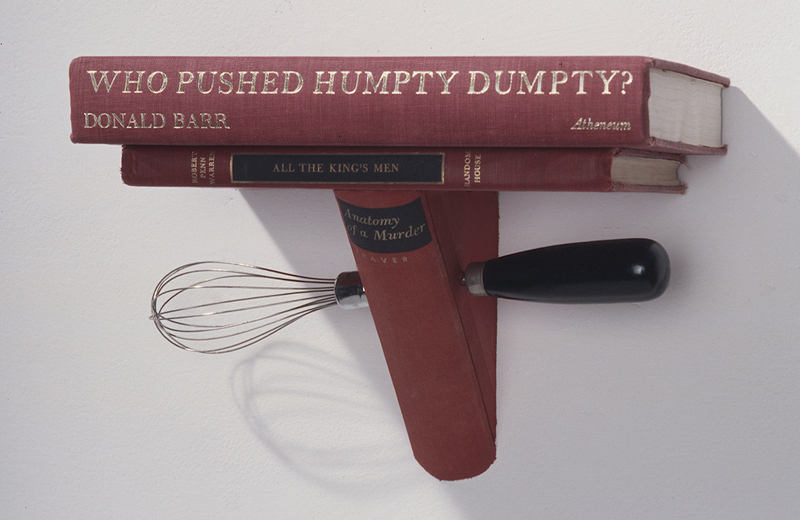 out of (humorous) groupings of old books. Look closely at these titles, and see if you don’t laugh. But the best thing was seeing so many kids enjoying reading. Two girls purchased copies of my books, then immediately dashed off to the lawn to start reading them. Whole groups of parents and kids sat down together for outdoor storytimes. It reminded me of some of the happiest moments of my own childhood, and restored my hope that not all kids are growing up as screen addicts. Not these ones, at least. So, while this introvert couldn’t have been happier to curl up in the silence of her own room after all the activity, overall the Bay Area Book Festival was a jolly, literary, inspiring weekend. I am not dead. That is today’s announcement. Actually, today’s announcement is (possibly) even better than that. Book 3 is almost done!!! In fact, this announcement is being made in a quick escape from the writing cave. Then I’m back to moving paragraphs, analyzing character motivations, and wondering how on earth I got so many prepositional phrases into that one random sentence. And how on earth to get them out again. Yes, those are peanut butter cups in the corner. But all YOU need to do is get excited for Book 3 of The Voyages of the Legend, coming early summer 2016!!! This will be second-to-last volume in a projected series of 4 books. Writing it has been a journey, but I hope you’re really going to love this new story. To celebrate the release of this book, I’m also excited to announce that Books 1 and 2 are getting a new look! These second editions will feature exciting new covers, an awesome new map, and even some bonus features, like discussion guides for easy use in classrooms or book clubs. The first editions will be retired when the second editions go live (hopefully near the end of this month), so if you want a first-edition copy, don’t wait! You can find one in select Bay Area bookstores or on Amazon.com. Wondering where to get your books signed this spring? You’ll find me at the Bay Area Kids’ Book Fair (Silicon Valley edition) on April 16 and the Bay Area Book Festival on June 4-5: both of which are amazing events and free to the public. Keep an eye on my News and Events page for even more upcoming fun. There are also still a few more months left in the school year, so if you’re a public, private, or homeschool co-op teacher interested in an author visit, send me an email! 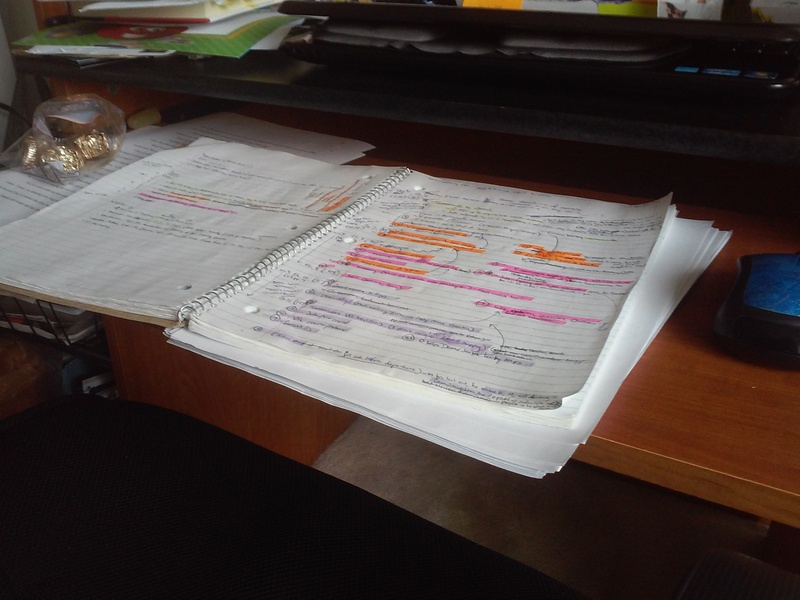 And now…back to the writing cave. This event was the first of its kind in the East Bay, with an estimated 50-60,000 people in attendance. Two days of nonstop immersion in books and readers. So. Much. Fun. 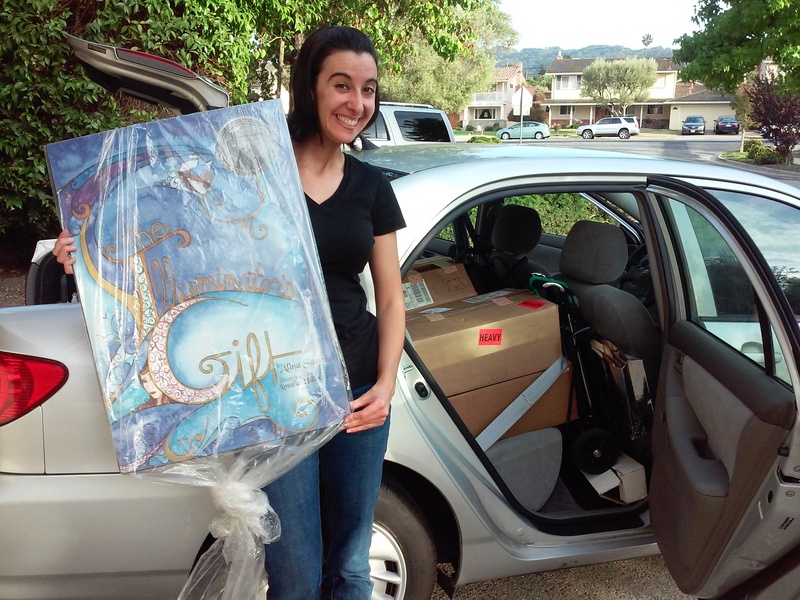 For starters, I learned that my little 5-seater car can tote 250 books, 3 carts, a box of art prints, and all sorts of other necessary festival paraphernalia. And still leave room to see out the back. On June 6-7, whole city blocks of Berkeley were closed to traffic and lined with tables and booths. My illustrator, Amalia Hillmann, and I had a table in the Children’s Area. 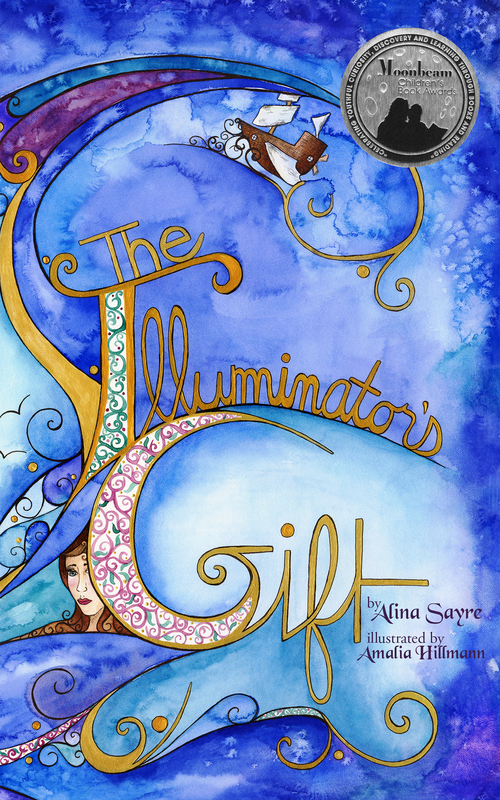 We had copies of The Illuminator’s Gift and The Illuminator’s Test , a coloring book, art prints of the illustrations (now online here), stickers, bookmarks, and all sorts of fun. There was a little of everything in the space around us: independent author displays, publishing houses, educational foundations, a guy twisting balloon dolphins and swords, and some amazing food trucks. I didn’t get away from the table much, but I did check out the art installation at the center of the festival. Lacuna was an interactive sculpture designed to feel like an outdoor library. It was stocked with 50,000 donated books that were free for people to take home. And did they ever! By the end of the weekend, the shelves were almost bare. Book jackets fluttered overhead, like the winged ideas enclosed within books. Our blue-draped Illuminator table saw a lot of action over the weekend. The Children’s Area was busy almost constantly. It was fun to chat with readers both young and young at heart (I was surprised at how many young readers preferred paperbacks to e-books). I even met a girl named Ellie. She was excited to find a book with a heroine who shared her name. On Saturday we had my amazing mom in residence, painting Vestigian designs on kids’ hands in shimmery metallic colors. We also had coloring pages and a box of crayons available. I liked this neon-pink version of Aletheia. The young artist explained that he was helping the islands with their advertising. Authors and illustrators gave presentations on a nearby stage throughout the weekend. After her presentation, I got to meet LeUyen Pham, who illustrated Shannon Hale’s latest book, The Princess in Black . She is just as nice as she is talented. 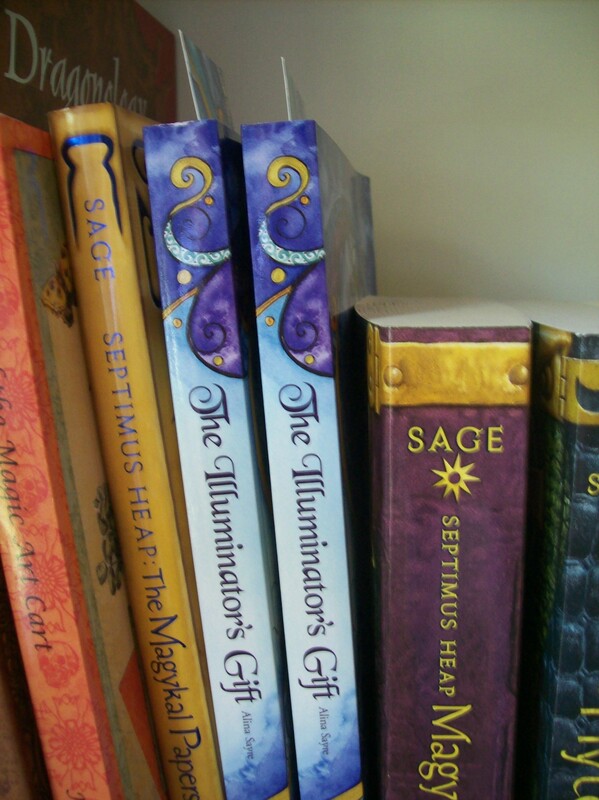 She even bought a copy of The Illuminator’s Gift. My only regret is that I didn’t take a picture with her. By the end of the weekend, I was exhausted, but satisfied. Though I’m not really a big-crowds person, I enjoyed meeting such a diverse assortment of people who all shared my favorite interest: reading. The organizers say they’re already planning next year’s festival for the first weekend in June. –A sculpture built of 50,000 books that readers can take home with them! -A visit with illustrator Amalia Hillmann and me! We’ll be at a table in the Children’s Area by City Hall, along with lots of other authors, bookstores, and book-related activity booths, including a stage where performances will be going on all weekend. At our table we’ll have coloring pages and face painting from The Voyages of the Legend, lots of different art prints and some cool new art products, and of course, copies of both The Illuminator’s Gift and The Illuminator’s Test. We’ll even be unveiling a reprinted edition of The Illuminator’s Gift at the event, complete with a map and some new illustrations! I can’t wait for the Bay Area Book Festival! All the details are on the event website. It will be a weekend of nonstop book fun! I hope to see you there!